Stephanie Hicks has lived in Bend, Oregon since 2006. 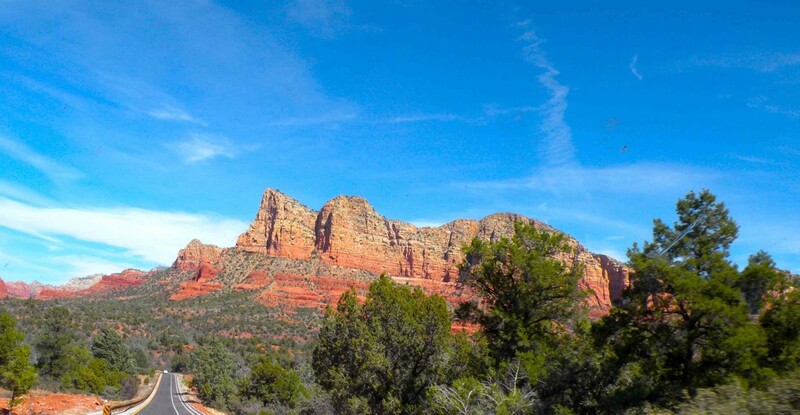 She is a trail runner and hiker and loves to take photographs of the natural beauty! My two passions in life (other than my family) are travel and photography. 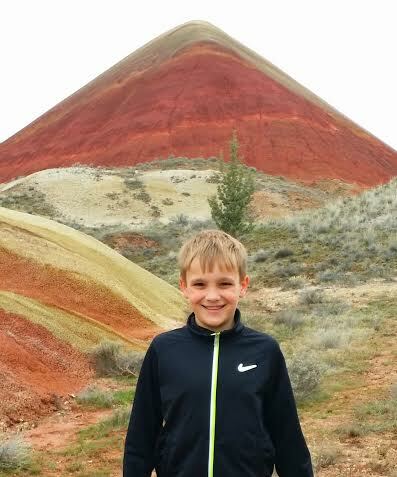 We have lived in Central Oregon since 2006, and I have always wanted to visit the Painted Hills, about 2 hours east of Bend. When my son and I visited in early Spring 2014, I wondered what took us so long to get here! 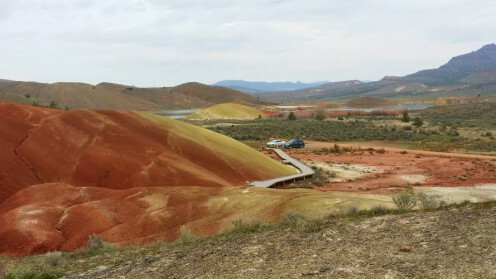 If you live in the Pacific Northwest, the Painted Hills are a relatively easy drive and much easier to access (let alone easier to park and less expensive) than other geological marvels in the region like the Grand Canyon, or Bryce Canyon in Utah. I admit that its amazing to visit Hawaii or Texas, but the best jewels are often those in your own geographical backyard! 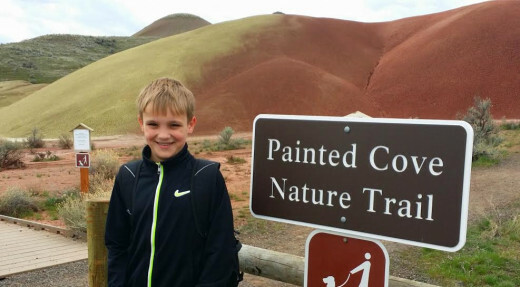 We are so glad that we finally took the trip to see the Painted Hills in Oregon. Our family lives in the heart of Central Oregon, in Bend. The region is known for its beautiful Cascade Lakes, skiing at Mt. Bachelor, fishing, hiking, Smith Rock and amazing cuisine. A drive east from Bend takes you to areas including Prineville, Mitchell, the Painted Hills, and Fort Rock, among other places. 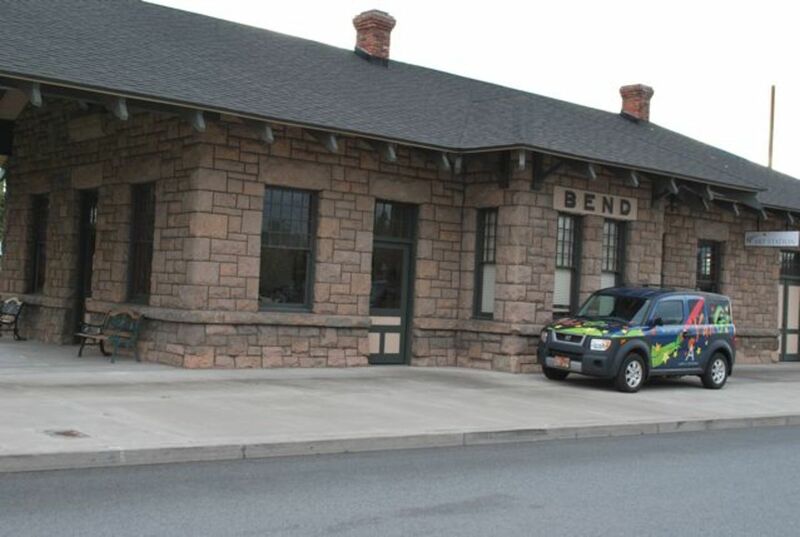 You can visit any of these locations as a day trip from and back to Bend. 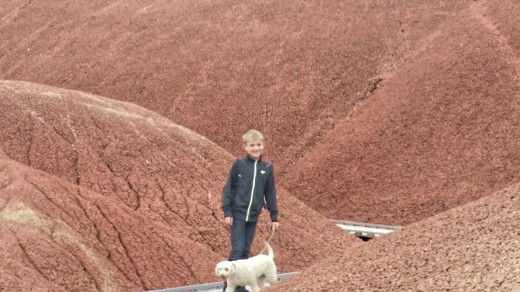 Our trip to the Painted Hills took us through the heart of Central Oregon, traveling east from Bend, Redmond and Prineville. Highway 26 runs east from Portland, over Mt. Hood. 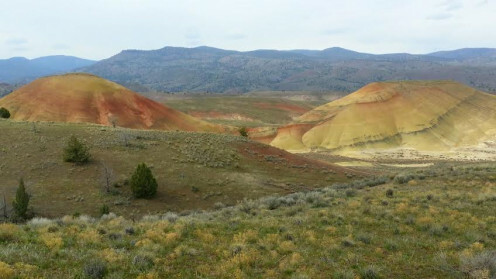 It is approximately 4.5 hours to the Painted Hills from the Rose City. For us, traveling from Bend takes a little less than 2 hours. Prineville, Oregon is the last metropolis though which you will pass on your journey. I recommend you should fill up your gas tank and purchase snacks and water before continuing on. 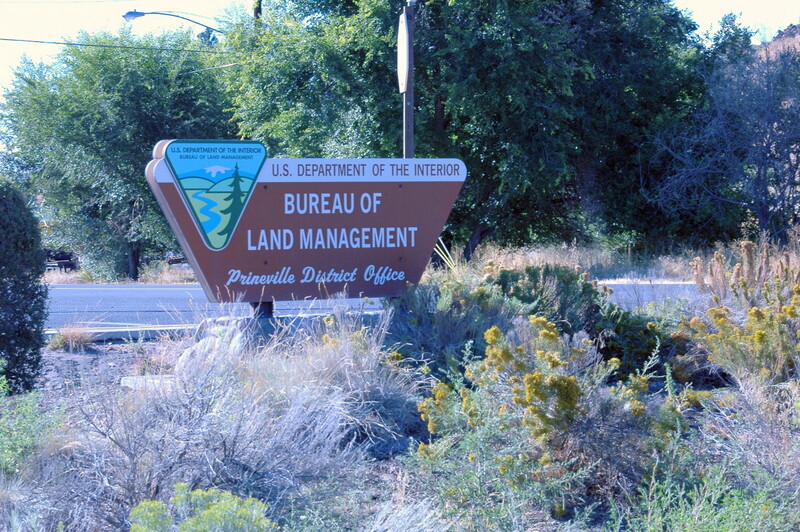 Mitchell, Oregon is 47 miles east of Prineville, and the cut-off to the Painted Hills is about 40 miles from Prineville. Leaving Prineville, continue following Highway 26 east of town over the Ochoco Mountains (4,700 feet above sea level) toward Mitchell, Oregon. Keep your eyes out for deer and other wildlife driving over the pass. We spotted a gang of wild turkeys right outside our car window! Watch for the sign that welcomes you to the John Day Fossil Beds National Monument and indicates a turn-off to your left (when traveling east) to the Painted Hills. 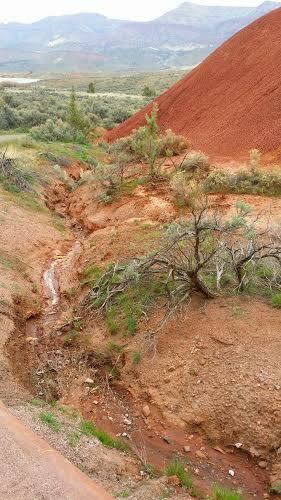 The park is approximately 6 miles from the highway along a rutted paved road, which turns to a dusty gravel road before you drive up the hills into the park. 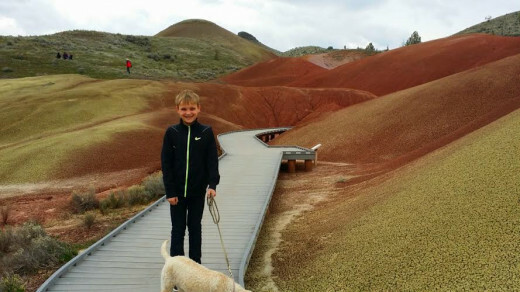 You don't need a Forest Service Pass or any cash to visit or park at the Painted Hills! At the entrance to the park is a Ranger Station at which you can get directions, information and use the restrooms. Our visit to the Painted HIlls in March was during what I would consider to be "perfect" weather. Most times, visitors will need to plan for weather. Use the bathrooms at the park entrance, about 1 mile away from the Painted Hills Overlook, right when you enter the park! There are no facilities on-site. 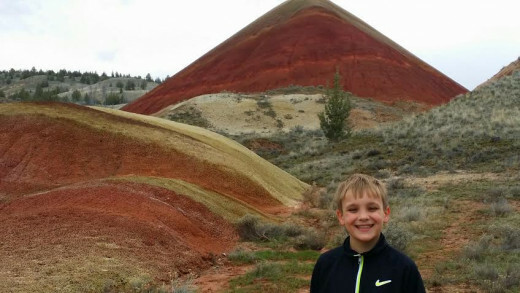 What Geological Forces Created the Painted Hills? As with many State and National parks in this area of the United States (the Lava Cast Forest, Fort Rock, Crater Lake, Smith Rock, etc. 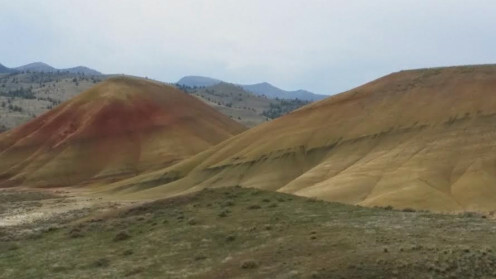 ), you can thank volcanic forces for the Painted Hills. The beautiful colored layers in the hills here are the result of volcanic ash that began being deposited in the region about 35 million years ago, during the formation of the Cascade Mountains. Numerous volcanic eruptions and a changing climate created layer upon layer of ash. The ancient tropical river valley has transformed to the barren high desert of today. Over time, the layers became compressed and mixed with various soils and minerals as the tropical leafy forest and river plain transformed into a barren high desert. Erosion and consolidation eventually changed the ash/mineral layers into bentonite clay. Black swaths in the Painted Hills consists of lignite from decayed vegetation. Mudstone, siltstone and shale layers show up as various shades of gray. 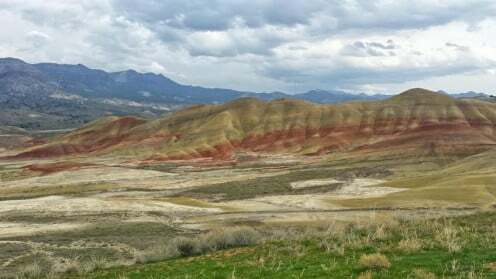 The red in the Painted Hills resulted from floodplain laterite soil deposits. 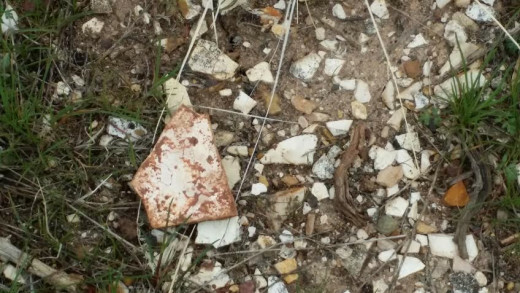 The beautiful colors of the various clay surfaces of the hills are permanently on view for the public because nothing grows there. 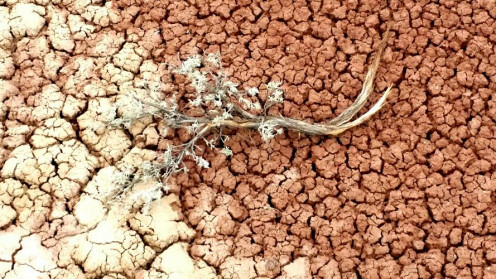 During periods of rainfall, the clay becomes saturated and effectively seals water within so that any seedlings cannot penetrate the surface. In addition, the loose surface particles easily wash away, again preventing a foothold for plants. The benefit of rainfall in the Painted Hills is that the absorption of water causes the surface to expand, which changes the surface tension, transforming reds and yellows to pinks and golds. 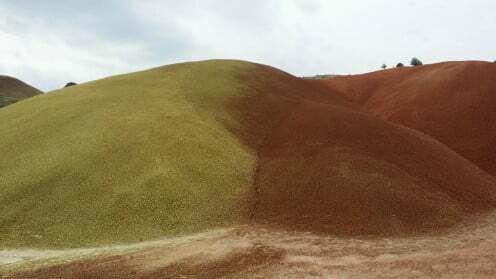 During dry periods, the hills appear with deeper colors. The best time to view the colors is at sunset. Each visit to the Painted Hills will be different - depending on the time of day, time of year, amount of sunlight and shadows from clouds above. 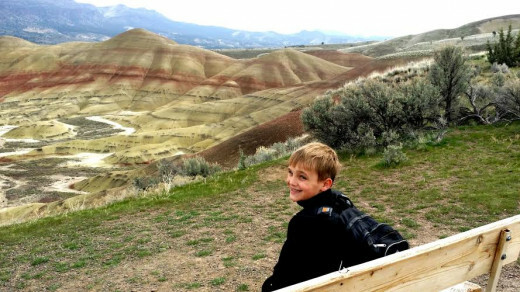 There are three units of the John Day Fossil Beds National Monument : the Clarno Unit, the Painted Hills Unit, and the Sheep Rock Unit. Each are relatively close (40 miles apart), but it is difficult to see all in a single day. Be sure to check the National Monument website to ensure that the units you wish to visit are open or if there are any travel advisories before making the journey. 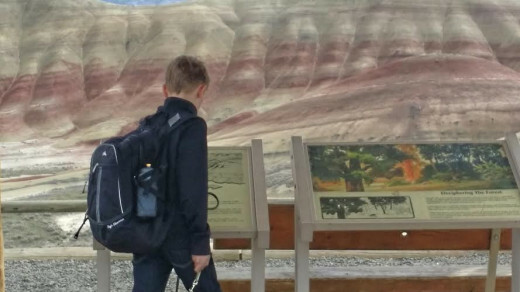 After you learn about the numerous fossils located within the Painted Hills Unit, you will want to visit the Thomas Condon Paleontology Center in the Sheep Rock Unit of the Monument. A fossil museum, bookstore, theater - as well as restrooms and drinking fountains - provide a welcome respite for visitors who have spent a large portion of the day outside. Less than 1/4 mile away is the James Can't Ranch Historic District, which is open most weekdays. It includes a fully-accessible cultural museum. 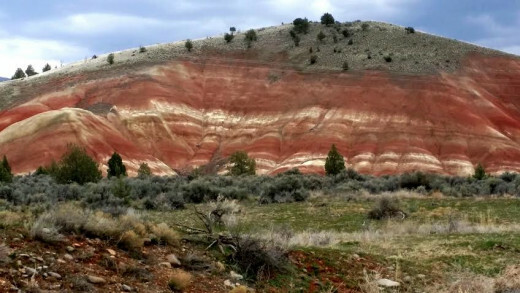 The Clarno Unit of the National Monument is 18 miles west of the town of Fossil, Oregon. Here, you will witness the majestic Palisades landform. Its creation predates by about 10 million years that of the Painted Hills. 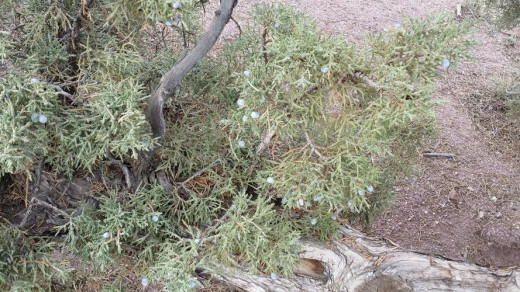 Once again, volcanic activity and mudflows, coupled with other geological and climate-based changes, transformed the area from a tropical rainforest into a fossil-rich region exposed to the winds and baking sun of the high desert. 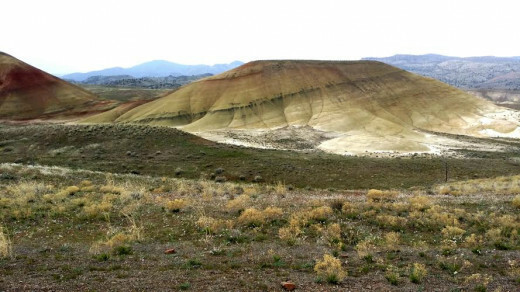 Why Take a Geology Course When you can Visit the Painted Hills? 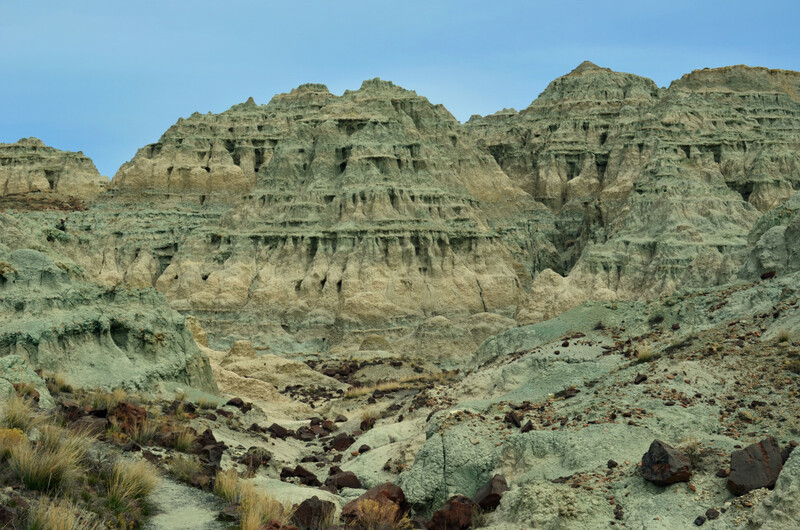 What is Your Favorite Geological Site in the Western United States? Restrooms/Facilities: At the entrance of the park - be sure to stop before heading up toward the various hiking trails. There are no facilities within the park itself. Accessibility: Trails are covered in loose gravel and are steep in spots, near drop-offs. The government is considering creation of ADA compliant trails in the future. Climate and Weather: The climate is generally mild, ranging from 40-80 degrees F. However, check the weather ahead of time. 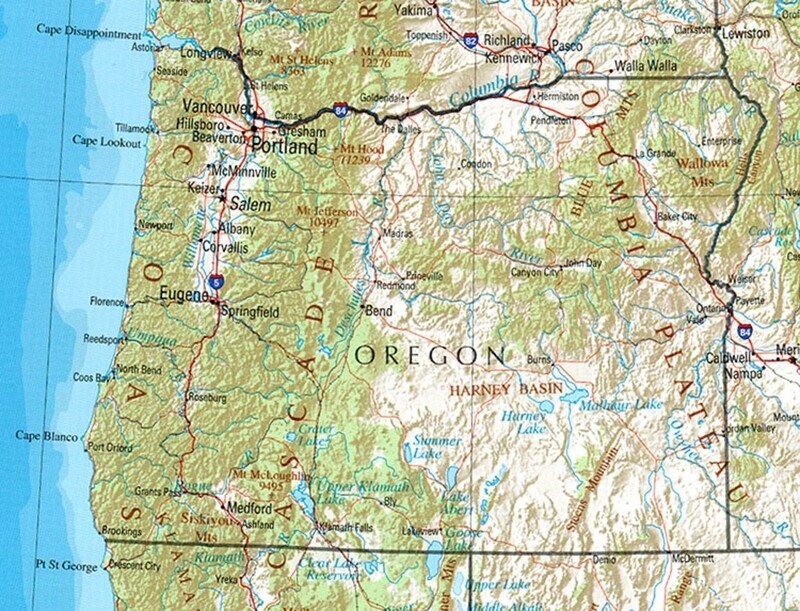 Winters in this part of Oregon can be very cold and icy (10-40 degrees F. On the other hand, summers may be brutally hot (80-100 degrees F), with little shade and no on-site water resources. Rain and snow may occur on occasion, but generally the region is arid. Special Park Uses: Check with the park superintendent if you wish to engage in any commercial activity or hold special events in the park (weddings, scattering of ashes). Fossil Research: You may not dig for or collect fossils, without a research permit issued by the monument's paleontologist. 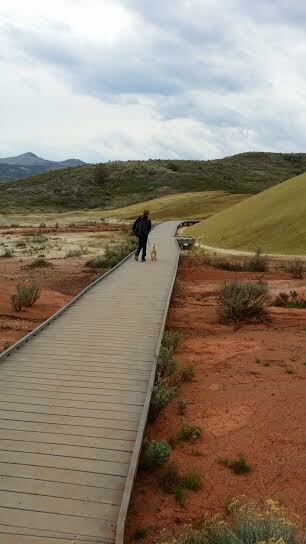 When we visited in March 2014, we walked 4 of the 5 public trails at this unit of the National Monument. Each of these trails are approximately 6-8 miles north of Highway 26 in Oregon. The one trail we did not hike, which I would definitely do next time, is the Mitchell Trail, which is 3/4 mile each way. Each of these trails are rated "easy," and require little effort, particularly because they are so short in distance. Strollers and/or wheelchairs can be used on these trails, except for the Painted Cove Trail which includes steps. Be prepared, however, that the trails are not paved, but covered with gravel. Grades are slight to low-medium in height. Great photos of this fascinating place. You've whetted my appetite for a visit but I don't know if I'll ever get to the US! This hub gives essential and interesting advice; something to print off and take with me should I venture there. I too love travel and photography. For the moment I'll have to travel there by hub! Superb read, thanks. I would love to see this in person. Thank you for sharing from your wonderful experience. very beautiful scenery. I'd like to go,but it's really far from China. What a stunning area! I would love to get out there sometime. The photographs are beautiful, Steph! I'd love to visit this area, and I live near enough that I might be able to. The colors are gorgeous! Thanks for sharing all the useful information. Thanks, stepchicks! The reason I asked is because I live far away in the south, so I won't be driving. Oh, thank you so much!! I have seen photos many times, but being there in person is without comparison! 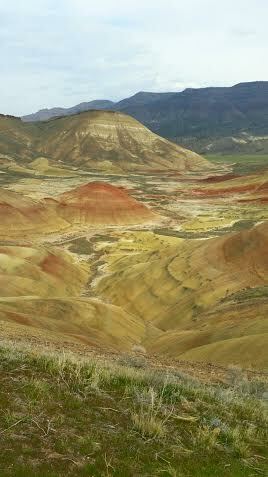 I sure hope you can visit the Painted Hills one day. I will check for you about guided tours. I know that they have school field trips and people can arrange to have weddings there too. 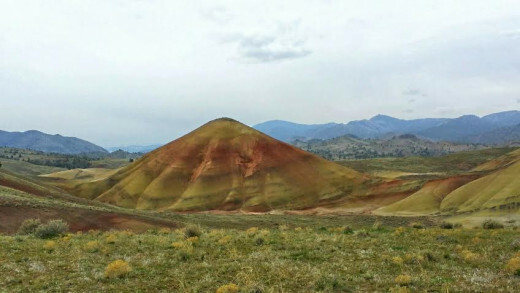 Travel is one of my passions too, and the Painted Hills is something I definitely want to visit. Those photos brought tears to my eyes. I can't imagine what I would do if I actually saw them. Do you know if there are guided tours to that area? Voted up, useful and awesome! This is beautiful -- although much different than what's around my neck of the woods -- and I'd love to visit. Thanks for the description, helpful information, and those images. So very interesting, well informed and presented . I've actually been there and it is pretty spectacular. It reminds me of Roosevelt Ntl Park in North Dakota. Cool pics, Steph. I'm glad you had a chance to go there. Love your photos. This is new to me. I hope to see this someday. Thanks to you. What a fascinating and beautiful area-- and though I have visited a lot of areas in Oregon, I had never heard of it. You did a good job of "selling". I want to see it myself.